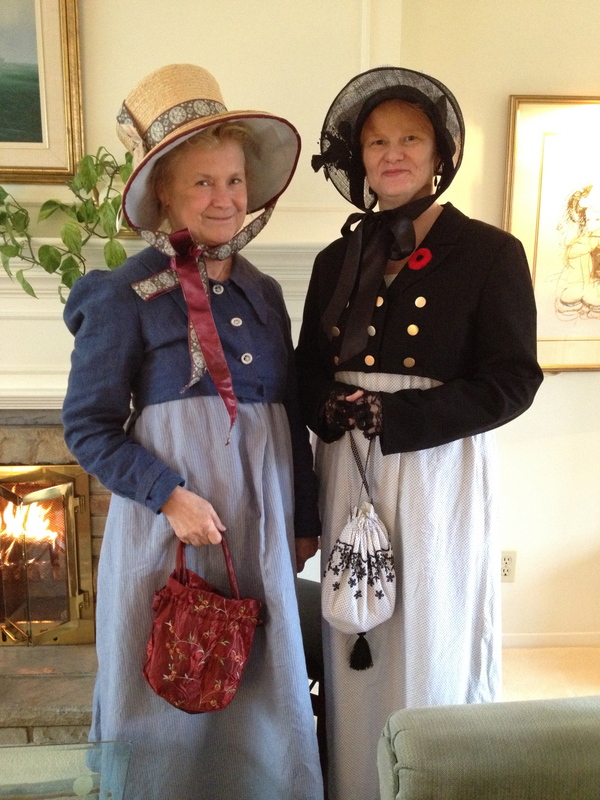 Two of our local JASNA Nova Scotia members, Lou Harrington and Anita Campbell, travelled to Bath, England in September to attend the Jane Austen Festival. Last Sunday, Lou and Anita entertained members of our Region with stories from their adventures at the Festival, and impressed us with the costumes they created to wear for the famous Promenade. Picture 600 people in Regency costume walking from the Royal Crescent to the Parade Gardens near Bath Abbey—or watch this four-minute video, and you can catch a glimpse of Lou at 1:19, and of Anita at 2:25. Here are some of the highlights they mentioned: tours of Chawton, Steventon, Winchester, and Stoneleigh Abbey; visits to The Royal Pump Rooms at Leamington Spa, The Holburne Museum, The Herschel Museum of Astronomy, The American Museum in Britain, and the newly restored No. 1 Royal Crescent; tea and breakfast in a private home, Kinwarton; and a book launch for A Carriage Ride in Queen Square: Easy-to-Play Piano Pieces for Jane Austen’s Bath, by Gwen Bevan (great-great-granddaughter of Austen’s niece Fanny Knight). Are you envious? I am! Anita made her linen/cotton dress using a pattern drawn from a museum original dating from around 1800 (from Past Patterns), and her blue linen spencer from a Regency Wardrobe pattern from La Mode Bagatelle. She even made the Dorset buttons herself, using instructions she found online. And—incredibly (to me, at any rate)—she made the bonnet from scratch, using a Lynn McMasters pattern for an early nineteenth-century seaside bonnet. Joleen Gordon from the Nova Scotia Basketry Guild gave her the straw plait, and it took her all summer to sew the straw on by hand. Anita says that while she has no formal training in costume or sewing, she’s always had a personal interest in costume research and she loves historic clothing. 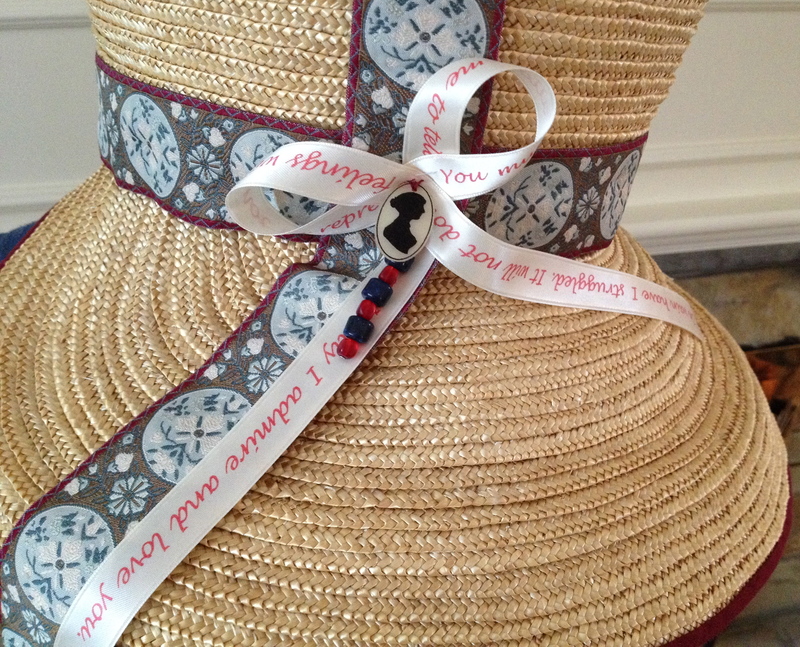 Detail of Anita’s amazing bonnet. Aren’t you tempted, like Austen’s Beautifull Cassandra, to place it on your gentle head and run off to seek your Fortune, or at least some ice cream and adventures? My dress on Sunday was a cotton muslin day dress, about mid-Regency. Sleeves and hem trimmed with broiderie anglaise. The spencer is a la militaire, and was fashioned from a modern blazer that I cut off. Brass buttons from my mother’s button jar. The hat came from a charity shop. I imagine someone wore it once to a wedding and then got rid of it. With some careful cutting and stitching, it became a bonnet. A bag of muslin over the crown and some ribbon completed the look. No one but a costume girl would really notice, but the shape is a bit more Gaskell than Austen so I may pull it apart to rework it someday. Just as Lydia might! This year was Lou’s fifth trip to the Festival. She’s attended every year since her first visit in 2009. 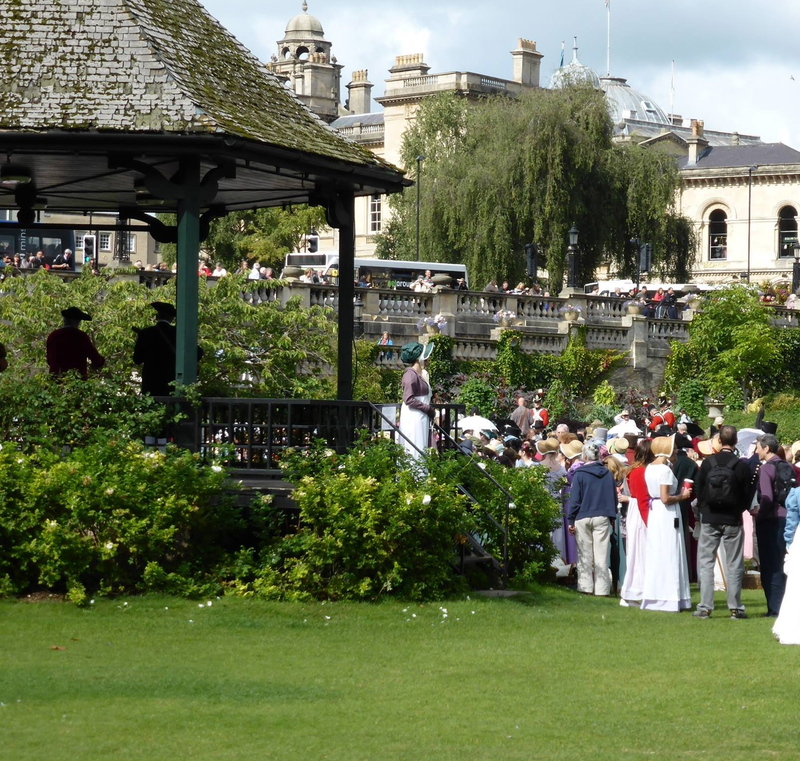 I’ve been to Bath and several other Jane Austen-related sites in England, but I’ve never been to the Jane Austen Festival. Have any of you been? If you have, what were your favourite events, talks, or tours? Lou and Anita and JASNA NS members: what would you add to my very short summary of the Festival? With nine days of Austen-inspired entertainments, it’s hard to keep track of everything! Those dresses are amazing! I wish I could have such talent! I agree, Lou and Anita are excellent and talented seamstresses. They’re talking about doing a workshop in the Spring to teach our group how to make reticules — they promise it can be done in an afternoon, and perhaps under their guidance I’ll be able to pull that off. Perhaps.